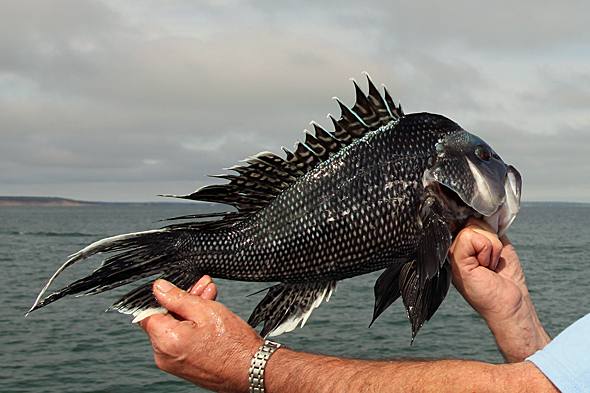 Black sea bass are a favorite target of Long Island anglers. Tasty and amazingly plentiful, fishermen are demanding that their strict regulation be relaxed. Photo by Tom Schlichter. There’s nothing like controversy to kick off a new fishing season, and when it comes to fisheries management there’s generally plenty to go around. Black sea bass regulations are the sticking point of the moment, and they have nearly everyone shaking their head. 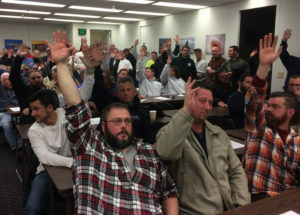 At a meeting in Stony Brook, NY on Tuesday, March 27, the NYS DEC and the recreational/for-hire fishing communities got to hash things out. In short, the DEC presented several sets of sea bass regulations designed to fit within the current federally mandated guidelines. The angling community made it clear that none of the options being considered were acceptable. Currently, black sea bass stocks are 240% above the species biomass target set by NOAA Fisheries, yet New York anglers have seen decreases in their allotted take for six of the past seven years. At what point, fishermen ask, will we finally be allowed to harvest more fish and enjoy the benefits of such a robust stock? To be sure, the DEC’s Division of Marine Resources Director, Jim Gilmore tried to assure anglers, for-hire captains and other industry stakeholders the he has heard their message and agrees something must be done. He announced that NY has joined the other states in the black sea bass northern regulatory zone – CT, RI and MA – in appealing a decision by the Atlantic States Marine Fisheries Commission (ASMFC). That decision allowed the five states in the southern sector, plus New Jersey, to liberalize their sea bass regulations while the northern states have to suffer reductions. While calls for lawsuits against the federal government and non-compliance with the federal guidelines ruled the evening, there was an exchange of ideas that left some a little more hopeful change would come quickly, some convinced it might not come at all, and many unconvinced that we would see any significant resolution in 2018. The DEC believes it has a good chance of reducing what is currently a 12% decrease for New York anglers to a 6% decrease – but nobody, fisheries managers included, believes a reduction of any type is an acceptable outcome. In the days since the meeting, I’ve had chance to interview quite a few of those who attended, plus NYS DEC Commissioner Basil Seggos. Following are some highlights from those conversations that didn’t make it into my Newsday Outdoors column on Friday, 3/30/18 due to deadline and space limitations. A show of hands was nearly unanimous when Capt. Jamie Quaresimo asked to see who supported going out of compliance. Photo by Tom Schlichter. 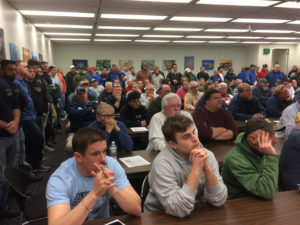 Fisherman at the Black Sea Bass meeting in Stony Brook listen intently as the DEC presents its management options. Photo by Tom Schlichter. We are intent to reverse this course in which New York anglers must face yet another reduction in black sea bass catches. The first step is the appeal that is already underway. The next step would be to going to NOAA fisheries, followed potentially by litigation, but all options are on the table. Non-compliance is not my favorite option, but yes, it is absolutely an option. We want to see if we can get something done prior to being forced into that corner – but it is one of the options that we have to consider. As Jim Gilmore said at the meeting, we stand with the fishermen. We understand their plight, whether it be sea bass, fluke or anything else. We are pushing ourselves and our team to be as aggressive as possible, particularly when the science warrants, as it does here. The bottom line is this fishery is healthy so the prospect of reduction of any kind to me has never made any sense. The positive part of going out of compliance, like NJ did last year with summer flounder, is that the Secretary of Commerce might not shut you down. He didn’t shut down NJ – but they lucked out, too. The fluke population in their waters was so low they actually under-harvested, so there was no penalty to pay back the next year because they never went over quota. The concern with black sea bass is that if the Secretary of Commerce doesn’t shut down the fishery we’ll be fishing unrestricted for a year. Because the fishery is so healthy, we could exceed the harvest we are allowed by a significant amount. We would have to accommodate for that the following year – which could lead to no fishery at all in 2019. It’s also possible that unrestricted catches might damage the stock in the long term; that wouldn’t be good for anybody. I don’t want to forecast where we may end up in a few months, but I will tell you we are not satisfied with the black sea bass regulations we have right now. That’s why we are going ahead with this aggressive appeal, and it’s why we are prepared to sue if necessary. In my mind, a 6% reduction is not an acceptable outcome. If we think we can get better results we will certainly try. We’ll, that’s the essence of fisheries management, and wildlife management in general, isn’t it? If you are not able to appropriately manage the species based on the science, then there are ripple effects. We are aware of that across the board. You see these kinds of things happen and fisheries scientists can predict the various outcomes. I put a great deal of faith in our scientists. They know what they are doing and want to have the flexibility year-to-year to manage the population as they see necessary. So, yes, it does concern me when these arbitrary quotas hamper our ability to give the industry a chance to do its job. Magnuson-Stevens is in need of reform. Certainly, what we have right now isn’t working and there has been talk over the years about the way it needs to be reauthorized and changed. We do need flexibility and, frankly, a reliance on better data. One thing that has been a big problem, and with fluke, too, is that the MRIP data isn’t working yet. It isn’t giving us good predictions on what the harvest is. Then, when you have that lag between the stock assessments and the MRIP data, you get exactly what we have right now – MRIP saying we are overharvesting because you are trying to rebuild the stock. As the stock recovers, people begin catching more fish so you need to recognize that and give the regulations time to work rather than changing the limits up and down with every fluctuation in stock levels. That’s a big thing that has to be fixed, providing that flexibility to allow stocks to rebuild and not over-reacting when you see a little higher harvest rate. I thank you for calling us, covering this issue and giving us a chance to weigh in. If I haven’t already made it clear, I’ll say so again: We stand with the anglers. The industry is vital to NY. Black sea bass populations are healthy and we want to give fisherman a chance to get out there on the water and earn a living. That’s where Governor Cuomo is on this, and that’s what we intend to do this summer. The Governor is directing us to take action and he is paying very close attention to our efforts. Between fluke and sea bass, we are going to battle for our fishermen here in NY. That comes from the top. The Governor, an angler himself, is personally interested in these outcomes. He’s the one who is really calling the shots. 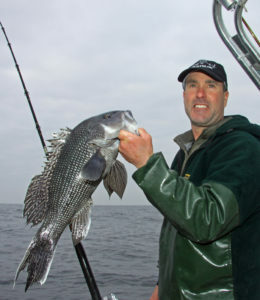 The massive 2011 year class of black sea bass is approaching the end of its life expectancy, which equates to some massive sea biscuits caught in recent years. Photo by Tom Schlichter. As far as Magnuson-Stevens reorganization, there absolutely is a need for increased flexibility. There are many different aspects of what needs to get done going forward. At these multi-state commissions, we are getting rolled. We had a vote that NY supported with the 12% reduction for black sea bass. The concept of New York voting for that while other states aren’t facing similar cuts is troublesome. Going forward, it is very important that all elected officials at every level of government are on the same page with the idea of being willing to go into non-compliance. It worked effectively in New Jersey where from republican Governor Chris Christie to democratic Senator Corey Booker, and many other elected officials in between, all were on board with taking a strong position against the quotas set for their state. They were willing to keep a strong position all the way up to Secretary of Commerce Wilbur Ross – and they ended up getting a result that they were looking for. I think New York needs to do the same thing right now. Whether you are in Washington or Albany, a senator, congressman or in the state legislature, everyone needs to hold the strong position of taking New York into non-compliance. We need to hold that position all the way up to Secretary Ross’ office in order to achieve the result we are looking for. If we are united in this effort, and effective and efficient in going about it, we can relatively quickly get guidance from Secretary Ross’ office as to whether or not he is going to support our request. But we have to be willing to take our case to him to get the results we want. And keep in mind that Wilbur Ross is a New Yorker. We can’t do this half-hearted or without being fully united. And we can’t drag it out too long. It should be done right now, quickly bringing our case to Secretary Ross and trying to get a quick decision from him. Commissioner Seggos has done a really great job on this, and on many other issues, for a great many years. I think he is an exceptional DEC commissioner. I have enjoyed working with him on many different fishery issues, and on other issues that have impacted my constituents. I think our effort is better off with Commissioner Seggos at the helm of the DEC and I think he’s doing a good job. I’m going to continue working with him on it. What did I hope to get out of the meeting? More fish, it’s a simple as that. That’s what we were all here for. 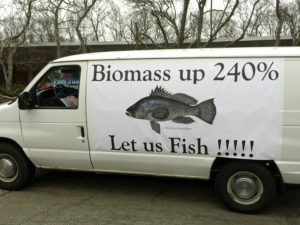 The data say we are 240% over the target goal for sea bass biomass. The restrictions are unjustified – and I worry about what the sea bass are doing to other stocks? These fish eat anything that swims or crawls. Having too many is just as bad as having too few. I’m sure they are gobbling up baby fluke and flounder. I’m all for conservation, but the degree of regulation is simply not warranted in this case. The sea bass population is not a hurting fishery. Capt. Kenny Higgins: Captree Pride, Captree, NY. None of the options currently suggested are anything we can work with. Three sea bass a person starting in July is a joke – and that’s our best option. It’s ridiculous! I don’t think we are going to get much, but at least this gave us a chance to voice our displeasure. Maybe it will help us get the politicians involved; maybe Congressman Lee Zeldin or someone. We need an opening in early June and we need more than three fish per person. A 15” size limit for the South Shore of Long Island is also ridiculous. It doesn’t reflect the size of the fish we generally catch. We get our big fish in late May and early June. By the time this season gets underway, the bigger fish have moved east. Twenty years ago we were allowed 25 sea bass per person with a minimum size of 9”. I’m not hoping for something like that, but 10 a person with a 10” minimum size and earlier season opening seems reasonable. This van summed up the sentiment of many anglers and stakeholders who attended the meeting. Photo by Tom Schlichter. I thought that emotions were running high at the black sea bass meeting. There were some very upset and irate people in the audience, especially from the for-hire industry on Long Island. I thought they were justified being upset. We have a fishery that is 240% over the rebuilt target stock and we are required to take a reduction. That is ridiculous. The reason we are required to take a reduction is because NMFS (National Marine Fisheries Service) has adopted a very pre-cautionary conservation standard which is over the top. They are preventing everyone from harvesting a resource that’s available. Their reason for the over-cautious measures is because they are afraid that the 2011 year class, which made up a lot of the biomass identified in the last benchmark stock assessment, is coming to the end of their expected life term. They put a 10 year rebuilding plan together and if it takes longer they try to just shut the fishery down rather than realize that maybe it might take 15 or 18 years to hit the goal. They don’t adjust accordingly. They would rather see those fish die of old age than be harvested by the fishing community. Ultimately, the change will have to come from the NMFS. That’s why everyone is hopeful that the Flexibility in Fisheries Management Bill – The Magnuson-Stevens Reform Act Bill – will be successful. It’s crafted to allow fishery managers more flexibility in their response to situations like this one. Going out of compliance is not a good idea because it will not only shut down the recreational sector, but the commercial fishing sector as well. I don’t’ think the commercial fishing sector will be willing to allow that to happen. I don’t see an outcome this year in which we get better than a 6% reduction – but stranger things have happened. The process will take time, and other states will be balking at the eventual appeal to NMFS. Bottom line: Let’s go out of compliance. None of these options are acceptable in the slightest little bit, so why are we talking about it? It’s insane. Close it down. Last year New Jersey went out of compliance on fluke. They ended up with more favorable regulations for both fluke and sea bass. 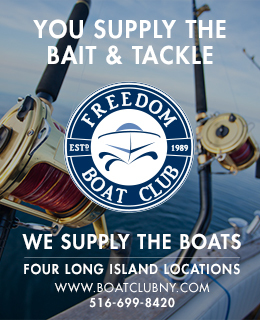 With them having 10 and 15 fish sea bass limits, what party boat on Long Island is going to carry any passengers? There’s a lot of dead discards with the size limit as things already stand. Our discard (throw-back) rate is astronomical. We’re catching tons of short fish. Thirteen-inch sea bass are more plentiful than anything else. You think they all live when you toss them back? Plus, the tight limits and short season for sea bass also puts more pressure on fluke. That’s not good. I think we go down the wrong path when we try to take fish away from other states like New Jersey. With sea bass, there are plenty of fish to go around. The data and the laws need to reflect that. We shouldn’t have to take fish away from another state. The DEC has to figure out how to pull them out of the ocean, not the quotas. I don’ think going out of compliance is a good idea. Currently the law requires that we manage recreational and commercial fisheries the same way. We can’t do that. We have to manage them differently because we can verify the actual catch on the commercial side by comparing the weigh-out data from a boat to its dealer reporting data. We can cross check that. We don’t have that ability in the recreational fisheries. On the recreational side, we use the MRIP survey, which can have high variability. So, to say that we have to account for every fish in the recreational fishery when we don’t have a system in place to do that is a flawed rational. We need the ability to manage the two fisheries differently. When we have a stock that is 2.5 times the target level as are black sea bass, going out of compliance brings additional risk. If we catch over the quota in that scenario we are going to have to pay that back. That could shut down the fishery completely next year – maybe even for the year after. We need some liberalization of the regulations; flexibility in the management system. If we exceed the recreational harvest limit on a stock this healthy we should have some wiggle room. We shouldn’t have to pay back every single pound because we don’t have the ability to count every single pound. The short-term flexibility may be the result of an appeal. The MAFMC and the ASMFC are scheduled to meet April 30 in Washington to develop an appeal that could eliminate or reduce the required reductions for 2018. The long-term solution is to amend the Magnusson Stevens Act to recognize that recreational and commercial fisheries must be managed differently, and to build in flexibility measures that recognize the differences between the two management scenarios.